This trip starts in Windhoek travels through the south of Namibia finishing in Cape Town, South Africa. 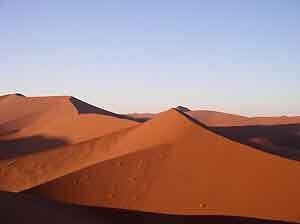 From Namibia’s Atlantic coastline, to one of the world’s most beautiful cities in the world, Cape Town, this trip will take you across vast tracts of Africa’s oldest desert, the Namib. From the vastness of the Namib-Naukluft desert, the spectacular beauty of the Sossusvlei ‘Dune Sea’ and the majestic Fish River Canyon to the richness of the wine growing regions of the southern Cape, this short safari is filled with natural highlights. Please note that this trip starts on Friday, early morning. Should you wish to spend extra time there an earlier arrival should be planned and additional accommodation booked. Pre Departure Meeting: A briefing will be held in Swakopmund upon arrival at the end of day 1. 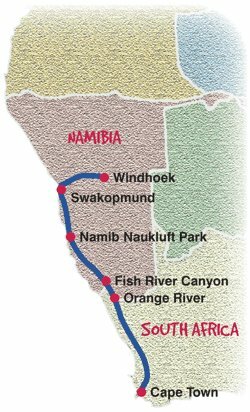 DAY 01: After boarding your coach in Windhoek early in the morning, it will be an easy start to your journey to the adventure centre of Namibia, Swakopmund. On arrival you will be met and transferred to your hotel. Founded in 1892 during the German colonial rule, the distinct colonial character has been well preserved. Swakopmund has several excellent restaurants, bars, coffee shops as well as many arts and crafts shops selling Namibian rural art. There are fine beaches to walk along as well as a great museum, aquarium and galleries to visit. This morning your trip will end. Please note that if you wish to partake in the many activities offered in and around Cape Town we recommend that you spend a few extra days post your tour. Accommodation can be arranged though your travel. Please note: This itinerary should be used as a guide only and may vary from day to day depending on road conditions, weather, political situations, and group decisions. Due to new tourism laws in some of the countries we operate in there may be a truck and crew change during the trip. All prices & Local Payments are subject to change with prior notice. Flights booked for arrival Jo'burg Monday 20 Oct 10h00 locally from Cape Town, and departure to Germany 19h50 Fr 24 Oct.
We want to have 1 nightdrive and 1 walk included"